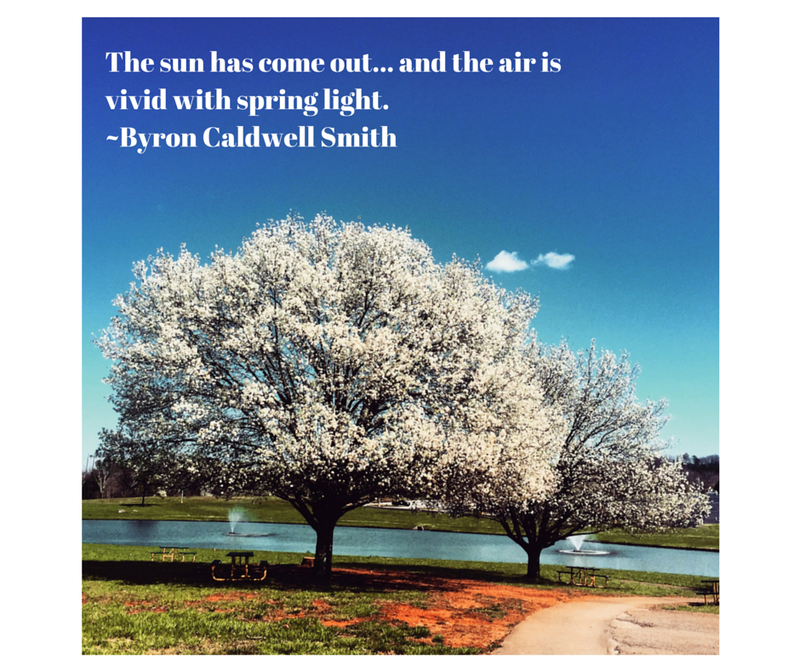 For the past several years, starting on the first day of Spring I’ve posted a quotation about the season as my Facebook status. I love Spring so much that I needed to celebrate! My friends seemed to approve, which encouraged me because who doesn’t like “likes” on Facebook? This year I decided to go one better. Having recently learned how to make quote pictures (with various easy-peasy websites), I’ve been illustrating the quotation of the day. I post just the words on my personal page, and the pictures on my blog page. Because I want to be able to pin them as well, I’m collecting them all here. I took all the pictures myself, but I can’t take credit for the words! I hope you enjoy them. Spring 2015, Knoxville Botanical Gardens and Arboretum. Spring 2015, Pellissippi State Community College campus. Spring 2015, Stoney Point Baptist Church Cemetery in Hardin Valley. Spring 2015, first crocus in my front yard. Spring 2010, front yard of our former home. Spring 2014, on the Pellissippi Greenway. Spring 2014, Anchor Park, Farragut. Just before Spring 2015, my garden. Spring 2010, the front yard of our former home. Spring 2015, Seven Islands State Birding Park. Spring 2010, in the woods behind our former home. Spring 2014, along the Pellissippi Greenway. Spring 2015, Knoxville Botanical Gardens and Arboretum. Spring 2015, Knoxville Botanical Gardens and Arboretum. Spring 2015, my front yard. March 2016, my front yard. Spring 2016, Sequoyah Hills Greenway. Spring 2016, Forks of the River Trails. Mother’s Day 2014, Melton Hill Park.